This was our first shearing day on our own farm. We hired 2 professional shearers to shear our herd. They were not only prompt....they arrived an hour and a half early....at 12:30 instead of 2:00pm. The problem was our helpers were not arriving until 1:30! The shearers said they would help with the animals so we jumped in. And thankfully our helpers, Barb and Byrd, arrived early and pitched right in! We wanted to keep things as calm for all the animals as we could. We brought in the girls first. The shearers were fast so the animals were only tied out for about 5 minutes. To determine how much fiber was sheared off we first weighed each animal; then they were sheared; and then we re-weighed. The 'winner' was our herdsire Journey with a total of 8.9 lbs of fiber! See the pictures....they show Journey before shearing; while being sheared; and after shearing. It's amazing how small the animals are once all their fiber is has been sheared! When the girls were done we brought in the boys. The problem is we forgot to do one 'little thing' first..... close the overhead doors so the boys could not see the girls! Our 2 herdsires, Journey & Accelerator, immediately started spitting at each other since they both wanted to go after the girls. The door came down FAST after we realized what was happening! The boys are stronger than the girls....their necks are unbelievably strong.....but between the shearers, Mike and Byrd, they were each tied out and sheared just as quickly as the girls. 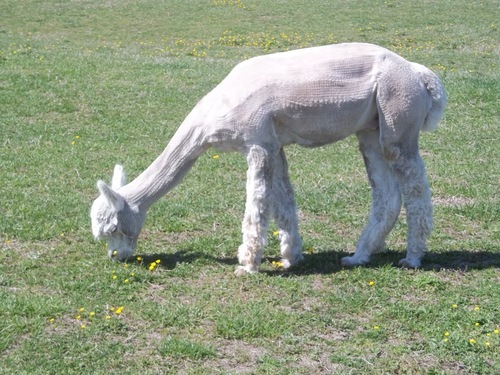 Shearing is stressful for the animals but it's a necessary step in herd health....the heat in NC would destroy them in the summer if they were not sheared. Picture yourself in 100+ degrees with really high humidity and wearing a heavy coat that is warmer than wool!! 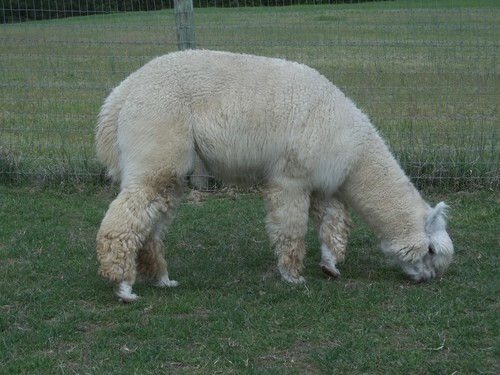 THEN we brought in Harry the Llama. He was not happy at all about this....spent most of the time he was tied out spitting out the grossest stuff imaginable!! 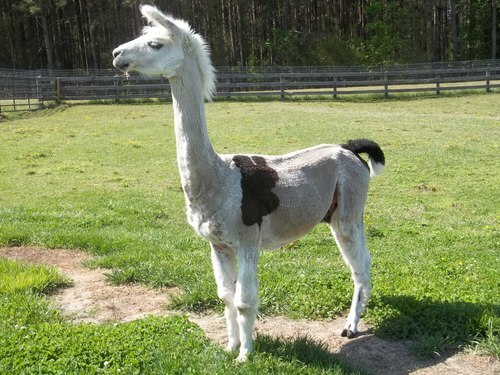 The shearers really like llamas so they asked if they could give Harry a mullet haircut and we agreed. See how proud he looks in his picture!! :-) After Harry was re-haltered, Sarah picked up the lead to take Harry back to the shelter......only to discover that the lead had been sitting in the 'spit pool' Harry had created while showing how deeply offended he was by the whole process. Oh well.....not much you can do once the green goo gets on you....so off Sarah and Harry went to the shelter. So by 3:00 all animals were sheared.....only Sarah had spit stink on her.....and the animals were ready for the hot summer. All in all we think our first farm shearing day went well.